Last spring for a course I put together an anthology titled Dragons in Winter. It ended up being a fun collection of short stories. I like stories with dragons and the idea of doing more anthologies with dragons felt like a good one. So, I am trying to put together another one, this time titled Dragons in Spring. 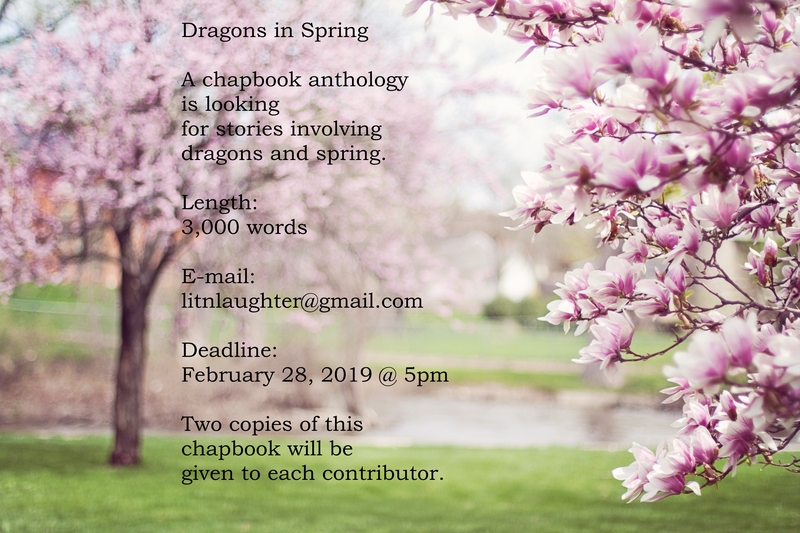 If you have a story about dragons in the spring of about 3,000 words send it to litnlaughter@gmail.com before February 28, 2019. If your story is accepted, you will receive two copies of the anthology. I used to have lists of topics I was going to write posts about, but since I moved I’m not sure where all those lists went. They are in the storage locker somewhere, I’m sure. Now I want to post regularly and I am having trouble thinking up topics to post about. The many things that are going around and around in my head don’t feel right to post about. When life is bringing me down, I pull into myself and quit posting on the internet in general. This last couple weeks have been so bad that I haven’t even logged into Twitter. I am hoping things will get better so that I can think of topics to write about. When I am feeling better these things come to mind easier and when I am down it is like my mind is too tired to work. One of the best things if feeling down is getting hugs. Finding someone who gives great hugs can be a lifesaving thing. It might not be easy and it might not feel like it helps at first, but it does. And if someone around you seems down, offer them a hug. My niece likes mermaids, along with fairies and unicorns, which means she wants stories about mermaids (and fairies and unicorns). I don’t mind too much because part of me has not moved passed those. I like mermaids and I don’t mind writing about them. I haven’t spent much time on writing stories with mermaids. Occasionally they sneak into small parts but never as main characters. I watch movies with mermaids as main characters and I really enjoy them. I also like reading books with mermaids as main characters. Being a mermaid hasn’t been a goal. I just like things involving water and pretty things under it; mermaids being one of the fantasy creatures from under there. So, when my niece asked me to write another adventure for Princess Aurelia with unicorns, mermaids made their way into the story. It was supposed to be a one off adventure and then see if inspiration hits for anything further. Instead it became the first chapter out of fifteen of a book; one chapter being mainly about mermaids. Now I am working on a short story with one of the main characters being a mermaid at a request of my niece. I will see where this goes. It never seems like it at the time but every word added to the document is progress on the story. Even that word that gets deleted because it doesn’t fit. It means you know what doesn’t belong in the story. If the only way you see progress is when you have done hundreds of words, you miss out on the small victories. There are some days when all I get is a sentence or two done on the story and if I expected myself to do more I would never feel like I am getting anywhere. But every word written is progress to a finished draft. Without those one word at a time there were be no hundreds of words progress. It can be hard to focus on one word at a time when the goal is fifty thousand or more but that is how the story is written. Also if you focus on the final goal of thousands of words it can feel like you are defeated if you only write a sentence or two for one day. If you realize that one word is progress every sentence becomes a victory. Victory makes it easier to get to those bigger word counts. Every year I make up a document with lists of things I want to accomplish during the next year. It is a list 52 books to read, 12 stories I want to finish writing, and a final list of editing projects that are haunting me. 2018 hasn’t been very productive as far as getting things off those lists, which I am accepting because I needed the mental break. However, I have managed to get some projects done. I finished some short pieces, a story for my niece, and published a romance novel by another Lit-N-Laughter author. 2019 is hopefully a year where I manage to get more items checked off those lists. From this prospective I think I can do but those things can change when I reached those points in the year. I also have a couple projects people are waiting for and I promised to get done. Most of the writing projects are on the list of 12 stories to finish but I don’t have a list for books to publish whether mine or someone else’s work. But New Year means New Hope for the future. I hope your New Year is a good one. Nothing says Merry Christmas as receiving a book you wanted. Also nothing says have a Merry Christmas as giving books to other people. I am much more likely to give people books than anything else they ask for. It works well because my family members each have a list of books they want. I also have a list of books I want. The biggest problem is not buying any of the books on the list before Christmas arrives. It is okay after Christmas once all the gifts have been unwrapped and you know which ones you still need. When asked what I really wanted for Christmas, my answer was a library. Someplace to put my current book collection on a more permanent basis and every book I want to hoard. I’m just not sure whether I want my desk and work station in there or my bed. I don’t have to sleep in the same room as books but it helps a lot for me to sleep. Also my bed is where I am most likely to end up reading most of the books I do. And it might be a little distracting from my work. When December arrives it is time to make Christmas cookies. They are great for so many reasons. It works to warm up the kitchen, the smell is better than any scented candles, and there is always plenty of love in them. Cookies that are still warm from being from the oven are like a hug. With the lack of sunny days, a hug is necessary for mental health. As long as cookies are eaten in moderation, they are a great thing for Christmas events. What does cookies have to do with writing? Lots. One of the best ways to get writing done is to reward yourself for progress. I do a cookie for every thousand words. It I can keep myself out of the cookies to keep to that deal, it works well to help me get the story written. Cookies can also be inspiration. You can have a character who wants a cookie or is enjoying a cookie only to find they need milk. A character could be remembering a time when they made cookies with a favourite relative, or when they enjoyed them as a child. As a writer cookies are great and Christmas cookies are just warm hugs. And who doesn’t like warm hugs? It is that time of year again. Time to write the family Christmas letter. For the last several years I have assigned myself the task as my mother quit writing them as she saw little to no point of letting people know what has been happening all year if the people weren’t willing to talk to us the rest of the year. Not to mention she was busy with other things. The first year I wrote what we did during the year, but really it was a boring exercise. Not only that there has been plenty of stuff I didn’t want to relive just to tell people in a Christmas letter. So, I decided that the best solution was to make things up. I figured that if they really wanted to know how the year went they would call or write or contact us by some method to ask. It is also much more fun and I like to make things fun. The first year some people got upset because it wasn’t the truth. After that I have only been sending it to people who are interested in receiving it. And I always hope they have as much fun reading it as I do writing it. I feel I should explain why I haven’t been posting when I had planned to be posting all year. Since having to move I have found myself battling my mental battles and it has been causing me to have trouble functioning, let alone writing. It is very much a myth that depression creates art. Instead it blocks creation of anything except negative thoughts. Negative thoughts tell you that making anything is pointless because it will never be good enough. But those thoughts are not useful for anything. The best time for creating anything is when positive thoughts are buzzing around in the brain. That is when the muse is most likely to visit. I am trying to bring my brain around to that place. Hopefully this means I am posting far more regularly along with more writing done in general. When finishing the first draft some people have found that the rewrite means they have to pare down their story. Most first time writers are assumed to have this problem and I have heard suggestions of taking out up to 20% of the excess. This has to do with overwriting. There was a time when a writer could fill pages with description without the reader complaining. Now the story needs to move along at a good pace and not be slowed down by too much description. The opposite end of things some writers need to rewrite things in such a way as they add to the story. The story is too concise and the writer needs to add more to it to help the reader be in the story. Sometimes this means adding things like description because the writer leaves much of it out. Both these require the writer to know enough about their style to know which they have to do when they get that far in their piece. Sometimes this is evident and other times it helps to have a beta reader.